Let me set the scene that inspired this collage: a beautiful grassy lawn in front of the Argyle, a private dining club in San Antonio built in 1854; children squealing as they run around, baskets in hand, in search of the hidden gold key to unlock the most fabulous life-size playhouse I have ever seen; me, a few yards away, glass of champagne with a cotton candy topper in hand, wondering how long I could get away with moving into said playhouse and claiming it as my permanent residence; bunnies (yes, real bunnies) hopping alongside your feet, leaving you wondering whether you are hallucinating this entire Sunday afternoon dreamworld; and Laura Nell Burton and Christin Gish of Cloche Designs across the way, impeccably dressed and completely composed (proof below), reminding you that perfection is achievable with some teamwork and a lot of heart. Check out the guest post I wrote about Cloche Design's legacy project here and peep the details on this next-level garden party here. 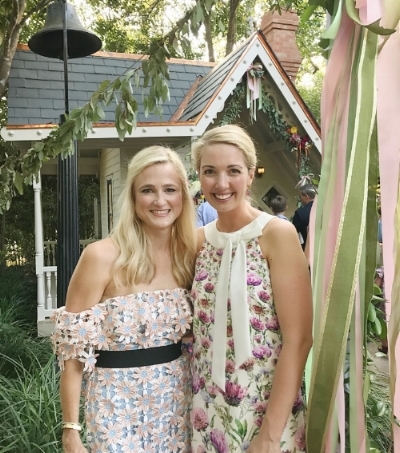 Party planners extraordinaire, Laura Nell Burton and Christin Gish of Cloche Designs. Follow their never ending fiesta here.